Small Stainless Steel Kennel Cup with Hanger -- approx 30 oz.. $5.95. "They are perfect, and the service I received at Gun Dog Supply was great." They are perfect, and the service I received at Gun Dog Supply was great. If I need anything like this again I will use this place again! "Great quality an even better price." Great quality & an even better price. Can't wait to get my puppy tomorrow to start using it. I like the functionality of it being portable from home to field too. Thanks again for the price & great product. "After a month, there isn't even water rings. It looks as new as the day we got it." This product hooks easily on the side of the crate/kennel that we use for our dog. It unhooks easily, refilling it is a breeze. It cleans so nicely. After a month, there isn't even water rings. It looks as new as the day we got it. "Perfect size for a medium kennel." Perfect size for a medium kennel. "I bought two of the hanging stainless steel bowls and one is great, but the other one does not sit right on the kennel, it is uneven and stuff spills out of it all the time." I bought two of the hanging stainless steel bowls and one is great, but the other one does not sit right on the kennel, it is uneven and stuff spills out of it all the time. "Overall, it's a good quality dish for the price." Overall, it's a good quality dish for the price. The bracket does not allow the bowl to hang level on a standard kennel door. The lower stabilizing arm is bent too far out. I'm sure a quick clamp in my vice will fix the problem. Too easy for the puppy to knock it off. Water spills and wets her bedding. 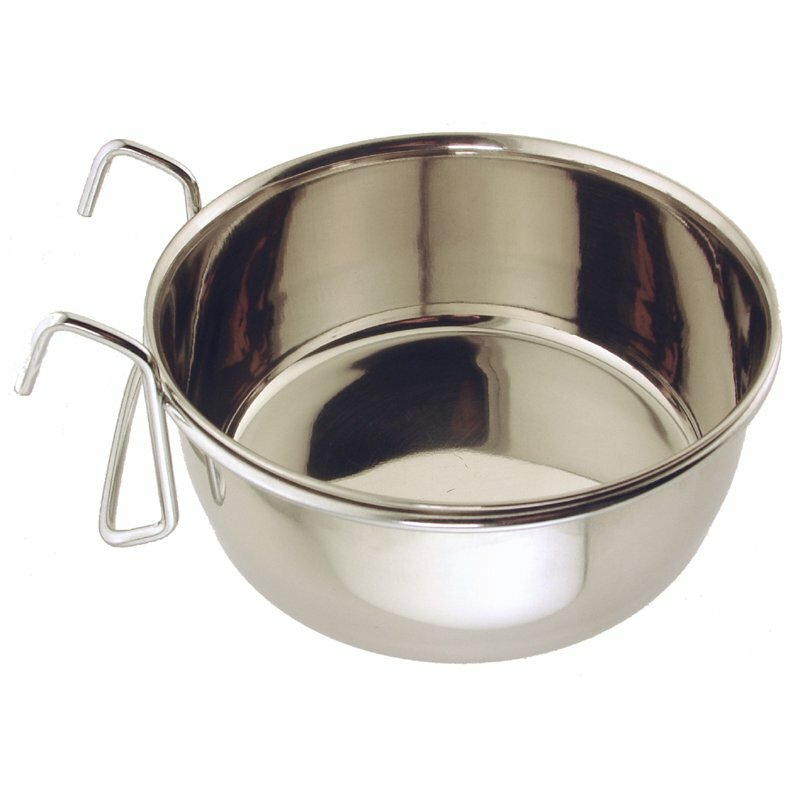 Small Stainless Steel Kennel Cup with Hanger -- approx 30 oz. Stainless steel water bowl / kennel cup hangs over (with wire hanger) fence or crate door. Top inside width: 5 1/2"
Medium Stainless Steel Kennel Cup with Hanger -- approx 60 oz.